Brooklyn Public Library has announced that geotechnical drilling to test ground quality around the site of the existing Brooklyn Heights Branch will begin this Thursday, July 23 and continue for about three weeks. The drilling, using truck mounted drill rigs, will be done during the hours from 8:00 a.m. to 5:00 p.m. on weekdays. The purpose of the testing is to prepare for demolition of the Brooklyn Heights Branch and its replacement by a 33 story residential and commercial building that will include a new library; a project that has not yet completed its Uniform Land Use Review Procedure (“ULURP”), with a public hearing scheduled by Borough President Eric Adams at Borough Hall on Tuesday, August 18 starting at 6:00 p.m. The cost of the exploratory drilling is being borne by the proposed developer of the new structure, the Hudson Companies. 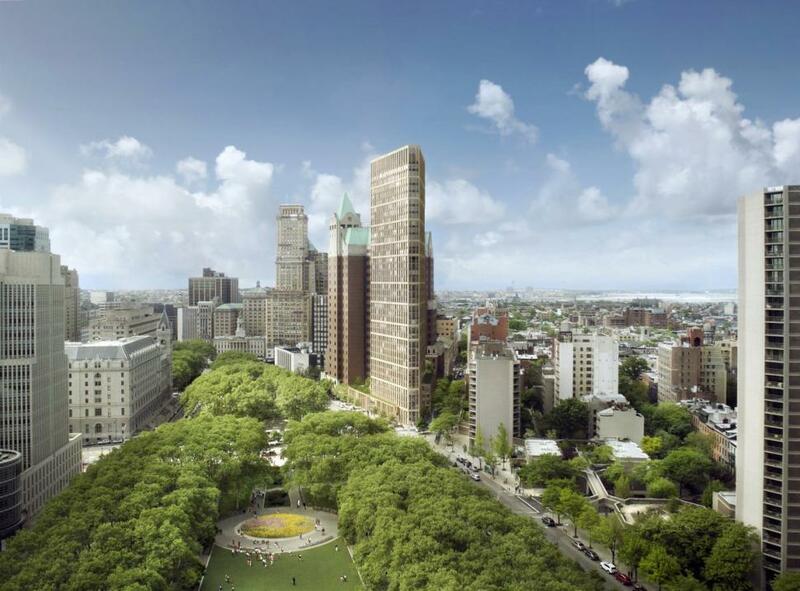 “As this mandatory ground quality testing takes place, the Library is working to minimize any impact on the surrounding community and ensure that our neighbors are properly notified,” said Kristie Maduro, project manager for the Brooklyn Heights Library redevelopment. Those most affected by the drilling will be residents of Clinton Street from Clark Street to Pierrepont, as well as along Clark Street between Monroe Place and Cadman Plaza West, and on the part of Monroe Place nearest to Clark Street. Writing in caps always means that they are serious. Sometimes my cat steps on the caps lock key and if I’m staring at the ceiling while I type I miss it. Maybe that’s what happened. This area is part of the terminal moraine from the last glacier, that formed all of Long Island and Staten Island. So if they expect to find any solid rock to build on, they’re going to be disappointed. Also, if you excavate anywhere in the Heights, you’ll hit sand with lots of rocks in it after about 10 feet. Of course, test drilling may make homeowners unhappy if cracks start to appear in their foundations. I think there’s actually a program to counter that. Never mind others on this blog, you are 100% right! This shows the absol-ute smug, arrogant attitude/mindset of the developers and the BPL. YOU CANNOT FIGHT CANCER WITH ASPIRIN!!! None of the even honest voices have brought themselves to the willing-ness to use some of the devices which have a real record of stopping serious assaults like this. Apparently the area, be it moraine or bedrock, can indeed support tall buildings, as is evident by the ones that have already been built here. Bedrock will support buildings bigger than the World Trade Tower. This highrise condo will only be half the height of NY’s tallest. Fortunately, among the many hospitals closed lately in NYC, Bellevue is still open. Expect a call soon. There’s at least one that recognizes random key mashing and can be programmed to respond in various ways but I’m not sure about caps lock. To the point, do you think such an app would help our friend? People who can’t argue facts call names. Real estate owners avoid city income taxes by claiming legal residency outside the city or even the country. An estimated 89,000 of the city’s condos and co-ops — valued at $20 billion based on city tax assessment data but with an actual estimated fair market value of $80 billion — are owned by people who claim to be nonresidents of the city. Mr. Shinider. Your tax burden will not decrease. A win win? Er, you left out a few things Rob…such as were getting only as much of a facility as the developers and the BPL directors will allow us. A much reduced facility a lot of it below grade. What we are also getting is an increase in population with NO commitment to increase public safety resources. All the necessary increases in public safety and infrastructure police, fire EMS, are going to necessitate serious public/ taxpayer’s funds to cover. The fiction that this or other such “ventures” as the Brooklyn Bridge Parkr example, will not be a new net tax burden is one of the great lies of our times. As a BH taxpayer, I would suggest the new library and its proponents go elsewhere and…rob…someone else…. There is certainly a clear prospect of damage to near proximity build- ings. Which INCLUDES Monroe Place. But the immediately reality is what is kind of foundation structure do they intend to install. So far the “leadership” of the Heights and even the most outspoken critics have not had the minimal intelligence to ask to see what is planned to hold the building in place. Given the gaggle of “personalities” involved, this is the first thing you want to see and then (gasp) you have to hire a nationally known safety expert to profession ally review the plans. This is where the Yale school of architects and the skyscraper safety campaign should also come into the picture. SOMETIMES I TYPE IN ALL CAPS BECAUSE I DON’T KNOW WHERE TO CAPITALIZE DE BLASIO. I think it’s every other letter, like chatroom robo-spammers in the 1990s. Apparently? Before there is ANY unsupported speculations there should be a full viewing of the intended build plans both the foundation and steel work. Then this has to be submitted to honest experts who are beyond the reach of being influenced by anything other than sound structural science. The material under a building is most important in terms of the down force of of the building’s weight. Crush. Factors like flex, torque, and shear due to wind loading and other causes are kept under control by the foundation design and design of the steel and flooring materials. But today the grim reality is that any building you would want anywhere near you and your family MUST have the greatest degree of protection against INTENTIONAL damage/destruction! Its just the real world we live in now….